It is very important to understand how and where to vote in the May 8th Election. Below are a few tips on how to make a difference in our community by making sure you are registered and know where to vote. Check my Voter Registration– It is very important to make sure you are registered. This will also allow you to understand what races you will be voting on. I am running for the District 1 seat on the Durham Board of Education. 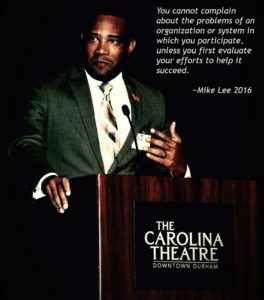 Please check your registration to make sure it is valid, and vote Mike Lee for Durham Public School Board of Education District 1. Register to Vote/Update My Address– If, for some reason, your registration is incorrect, please use this link to register or update your voting information. Find my Polling Place– Don’t know where to vote? Please click this link to find your polling place. This information is for your precinct on election day. Early voting is done at the County Board of Elections, the North Regional Library, and the South Regional Library. Check the Status of my Absentee Ballot– If you are in need of an absentee ballot, this link is how you request one. Check the Status of my Provisional Ballot– For any reason you are not in the system, you have the right to cast a provisional ballot until the problem is resolved. Do not let anyone at the voting location tell you that you can not vote. More information can be found at this link. Copyright © 2018 Vote Mike Lee. All rights reserved.